Genetics refers to the study of how parents pass on various traits to their offspring through genes. Eye color, height, personality characteristics, and many other individual traits are largely influenced by genetics. In the mental health field, the role of genetics is relevant to personality formation and the development of mental health issues. In the early days of psychology, debate over nature and nurture thrived as theorists argued whether an individual’s genes or environment determined their personality. It is now known both genetics and environment play a role, and most characteristics are determined by a combination of each. For example, someone with tall parents may also be tall due to genes; but, if their environment does not include adequate access to nutrients, this can impact their height. A person inherits half of their DNA from one parent and half from the other parent. Many traits, both physical and psychological, are determined by a combination of multiple genes. Genetics is a complicated and emerging field, and most aspects of physical appearance and personality cannot be tied to one specific gene. However, as understanding about the role of genetics continually increases, researchers may be able to better understand why people look and behave the way they do. Genetics plays a significant role in an individual’s intellectual ability, social attitudes, preferences, and personality. Research has shown that genetic influence on personality traits, such as extroversion, neuroticism, openness to new experiences, and conscientiousness, is about 40 to 50%. In fact, it is believed all psychological traits are influenced by heredity to some degree. In the mental health field, genetics is also important in understanding how mental health conditions develop. Many mental health issues are genetic, meaning people whose parents or other family members have them are more likely to develop them as well. Schizophrenia, for example, is thought to have a heritability rate of about 80%. Depression is also influenced by genetics, and research has found that individuals with a specific genetic variant are more likely to develop depression during stressful life events than people who do not have that variant. Other mental health conditions shown to have a genetic link include bipolar, substance abuse, obsessions and compulsions (OCD), and anxiety. Some behaviors in animal species seem hardwired, or genetically predetermined. For example, cockroaches revert to a dark corner of the room when lights are turned on. These instinctual behaviors are considered the result of evolution: the behavior occurs because it helped previous generations survive. However, the link between genetics and behavior is much more complex, especially in terms of human behavior. Behavior is determined by a mix of personality factors, genetics, past experiences, and circumstances. Researchers do not believe genes directly determine behavior. instead, genes are thought to influence brain function, which then affects behavior. Additionally, there is an increasing understanding of the idea that environment can influence gene expression and behavior. While an individual’s genetic makeup can have an influence on their behavior, most people generally have the flexibility to make changes to behavior based on environment and circumstance. Genetic psychology, also known as behavioral biology, is a field of study exploring how genes influence personality. Genetic psychologists typically conduct research on how specific genes influence human behavior and personality. Twin and adoption studies, commonly used in the field of genetic psychology, can help researchers learn about the role of heritability in traits since monozygotic twins share identical genetic makeup. If both twins exhibit a trait, it may indicate that trait has a high degree of heritability. Adoption studies, on the other hand, can demonstrate the influence of environment. People who are adopted may not have genetic commonalities, but they grow up in a similar environment. Genetic similarities between adoptive parents and children or among adoptive siblings are typically attributed to environment. Those in the field of genetic psychology work to advance understanding of how genes influence personality and behavior. It is possible that in the future, scientists will be able to conduct studies when a person is born to determine what kind of environment they need to thrive, based on their genetic makeup. In the fields of genetics and genetics psychology, new research emerges frequently, and advances continue to be made. A team of international scientists recently established a link between genes and cognitive ability, for example. They believe this could pave the way for the development of new, more effective treatments for issues such as schizophrenia and attention-deficit hyperactivity (ADHD). Another recent study found 18 genes that may be connected to autism. This finding is important because it provides an increased understanding of what causes autism by linking it to specific genetic mutations. 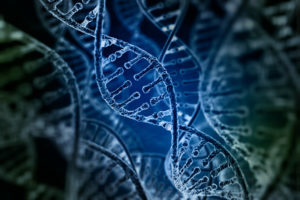 As research concerning the role of genetics in mental health issues develops, it is likely mental health clinicians will gain a better understanding of treating these issues. Genes or Environment: What Causes Eating Disorders?